Top quality British Union / King's Colours flags made from durable heavyweight knitted-Nylon. They are finished with a strong canvas heading and 2 brass grommets. These flags look great both outdoors and indoors. 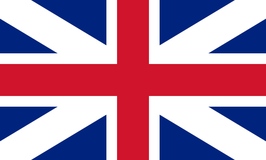 Today, the British Union Flag (also called The Queen Anne) is used by United Empire Loyalists of Canada and other British loyalist organizations.